Finding a snake in or around the home is something that no homeowner wants to experience. Even though most snakes are fairly harmless and are scared of humans, they still pose a significant health risk to you and your family. 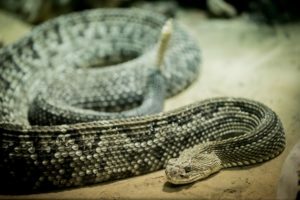 If snakes do make their way into your home, we recommend calling a professional right away, but there are some things you can do to help prevent them from ever getting close. Snakes seek shelter and nest in areas that offer darkness, concealment, and protection from the elements. Things like firewood piles, mounds of rocks, or any sort of debris make for great snake hideouts. By carefully clearing up the clutter, you’re giving snakes one less option for staying on your property. Most snakes, even ones that are very long, only need a couple inches worth of concealment to be nearly invisible. This is why it’s so important to regularly mow your yard, especially during the warmer summer months when grass is growing its fastest. Snakes generally don’t seek shelter in bushes or hedges, but their food sources certainly do. Critters like frogs, worms, and even mice often use hedges for shelter, and by maintaining and trimming them on a regular basis, you help reduce the food sources available around your home. Because of their small size, snakes can get into your home through openings as small as ¼”. Seal off holes in walls, cracks in the foundation, and repair any doors or windows that do not close properly to keep those slithering pests out. While these tips will help keep the snakes away, we strongly urge you to call a professional if you see activity in or around your home. Many snakes are venomous and can cause life-threatening injuries if the proper precautions aren’t taken. Call Critter Control® of Dallas today at 817-222-1101 with any questions or to schedule your free home consultation.